Small change of plans. I've scrapped the pissaladière as a canapé, and replaced it on the birthday menu with flammkuchen. I received the recipe via email this week (danke schoen! ), and having loved it in Germany, had to try my hand at it. The dough is so easy to work with. 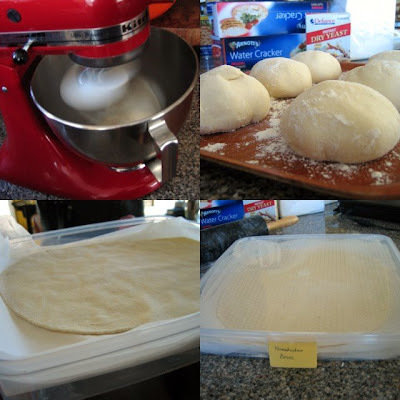 I let my KitchenAid do the heavy kneading, and I was able to leave the dough overnight in the fridge before rolling it out, without it coming to harm. I topped them with sour cream, thyme and red onions. I added bacon pieces to half the flammkuchens, and diced cooked chicken to the others. It worked! It more than worked. It was amazing. Sour cream + onions = happy times. The whole flammkuchen was like a giant crunchy Arnott's shape. Hell yeah! Although we loved the pissaladière, we loved the flammkuchen more. It's also a safer option, because lots of people, unfathomably, don't like anchovies. So, with the flammkuchen decision made, let's go back to the party planning. If you're organising an event, it helps to be organised. 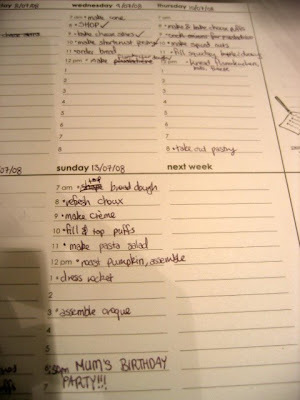 Here's a small pic of this week's page in my Kikki.K Weekly Planner Pad. ... baked those cheese stars I'd frozen... (The instruction: "DO NOT EAT!!" is more for me than for my family... they're so addictive!). ... and made more flammkuchen dough, letting it rise slowly overnight in the fridge. Today, I kneaded and rolled out the flammkuchen dough. (I say "I kneaded", but in reality the KitchenAid dough hook kneaded, while I sat down and had a cup of tea and biscuit). It's really easy to roll the dough out very thinly. I think the buttermilk in the dough makes it extra pliable. I got 6 pieces out of the dough, and layered them between baking paper to stash in the freezer. ... and whipped up a triple batch of The Union Square Cafe's Bar Nuts (recipe from Nigella Bites). I've just gotta buy some chilli olives from my fave Italian supermarket, and nibbles are sorted! Is it ridiculous to be excited by reading all about the preparations for a party by and for someone you've never met, half way round the world? Who cares! I am excited - it's such fun to read all about your preparations (I'm in awe of your organisational skills too!) and I'm looking forward to hearing all about the party itself. It'll be fabulous! You are awesome, and totally making me want to throw a party. 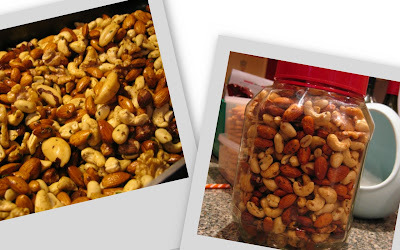 Those nuts are very addictive so good thing you made lots. The German pizza thing looks incredibly good and...am I right in thinking your freezer must be the size of an apartment building or something? You keep putting things in there! I'm excited about the party too Sarah and I don't know your mum either. The planning looks like so much hard work. Luckily you're doing it and I get to have lots of fun reading about it. You should get a job as a professional party planner/catering person. Yay! Thanks guys! We're really excited too. Dad bought the drinks last night, wooooah! I'm very tempted to make the cheesy stars after seeing yours! Which brand of cheese did you use? Is it available at Coles/Woolies? Good luck with the party! Hope everything goes well. 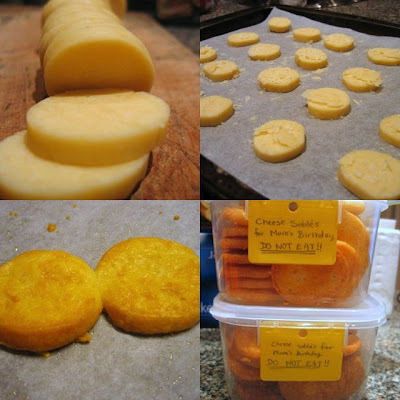 Normally for the cheese stars you're supposed to use Red Leicester (which I've found at my local Coles), but for this massive batch, I used mature cheddar and it worked out quite well. I hope you enjoy making them; I've found them to be soo popular!